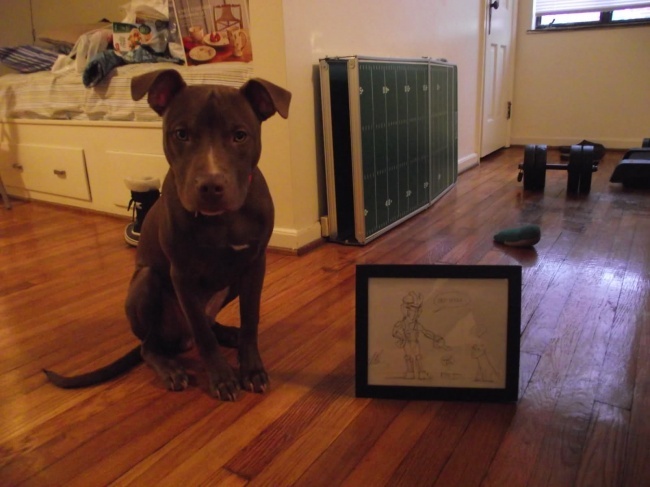 When a fan of Dead Space 2 has her game disc broken by her dog and complained about it on Twitter, the guys at Visceral Games surprised her with a not-so-random act of kindness. 22 year-old Ashley loved the first Dead Space, but when she heard that the developers were considering toning down the horror for the sequel, she was pissed. So she went to Twitter and complained about the change and ended up getting into an exchange with someone on staff at Visceral Games. They both followed each other, but Ashley eventually forgot about the conversation. When she got Dead Space 2, she found that her reservations were completely unfounded as she loved playing the game. Unfortunately, her dog (which resident dog expert Susan Arendt thinks is at least part pit bull while being at least 90 percent adorable) knocked over Ashley's Xbox 360 while she was playing the game and the game disc somehow broke, rendering the game completely unplayable. She loudly complained about the incident over Twitter, and that's when the power of the internets took over. The individual from Visceral Games, which Ashley doesn't name but one source claims is the art director of Dead Space 2, sent her a direct message asking for her address. 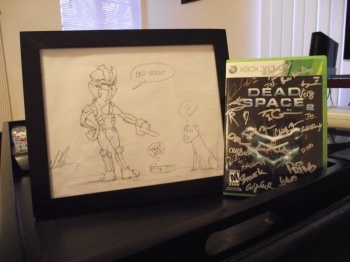 Yesterday, she received a package in the mail that contained a brand new copy of Dead Space 2 signed by every member of the team at Visceral, and a drawing of the game's protagonist Isaac personally scolding her dog. "Bad Doggie!" the cartoon Isaac exclaims. "it was awesome. it was amazing. it was WAY more than i EVER expected," Ashley wrote. "i found myself leaking liquid from my face again, but this time in the happiest form of the way. this was BY FAR the nicest thing anyone (especially anyone i didn't even know) has ever done for me." I have to say that's one of the coolest stories of a game dev reaching out to a fan that I've heard in a long time. It almost makes me forgive Ashley's terrible grammar and her refusal to capitalize properly.